Between 1975 and 1978, the Khmer Rouge carried out genocide in Cambodia unparalleled in modern history. Approximately 2 million died – almost one quarter of the population. 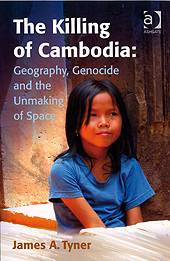 Taking an explicitly geographical approach, this book argues whether the Khmer Rouge’s activities not only led to genocide, but also terracide – the erasure of space. In the Cambodia of 1975, the landscape would reveal vestiges of an indigenous pre-colonial Khmer society, a French colonialism and American intervention. The Khmer Rouge, however, were not content with retaining the past inscriptions of previous modes of production and spatial practices. Instead, they attempted to erase time and space to create their own utopian vision of a communal society. The Khmer Rouge’s erasing and reshaping of space was thus part of a consistent sacrifice of Cambodia and its people – a brutal justification for the killing of a country and the birth of a new place, Democratic Kampuchea. Contents: Imagining genocide; Irruptions and disruptions; The improbable revolution; The un-making of space; The placelessness of democratic Kampuchea; The political and the subject; A political understanding of genocide and justice; Bibliography; Index. About the Author: James Tyner is Professor of Geography at Kent State University, USA.